Last Sunday, Council members Jim Bannar, Brian Bauerle and Carolyn Jacobs all got a lesson on the art of spinning and weaving at Historic Barclay Farmstead's first open house of the 2016 season, which marks the 200th anniversary of the Farmstead. There were a variety of activities and items for visitors to see and learn. The Friends of Barclay led guided tours, demonstrations and craft embroidery for all to enjoy. If you weren't able to join us last weekend, the Farmhouse will be open for public tours the first Sunday of every month through November. Click here to learn all about Barclay, and for updated information about the Barclay 200 celebration as we move through 2016. For more information, call (856) 795-6225, or e-mail info@barclayfarmstead.org. Be sure to follow @HistoricBarclay on Twitter and Barclay Farmstead Museum on Facebook for information on upcoming events and activities throughout the year. 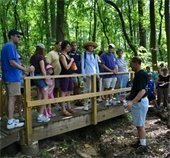 Take advantage of this weekend's beautiful weather and spend some time touring Cherry Hill's incredible trail system! SNJ Today highlighted the Township's plans to make our busy trails accessible to all residents, with the help of grants from the New Jersey Department of Environmental Protection. Our plans include the installation of handicap-accessible pathways through our nature trails, including along the Old Orchard Trails' Blue Trail, as well as portions of our nationally-recognized trails at both Barclay Farmstead and Croft Farm. Our trails are one of our community’s greatest natural assets, and a tremendous source of pride that have been lovingly maintained and improved by the all-volunteer Cherry Hill Environmental Board and Trail Crew, in partnership with community volunteers. They serve as an important link between our residents and our local wildlife and natural habitats, and provide a beautiful respite from suburban life, and I am eager to see these improvements move forward, so that all of our residents and visitors safely, easily access and enjoy these special amenities. Click here to see the video from SNJ Today. Mayor Cahn speaks to members of the Township's Citizens Cabinet on Tuesday, March 8. On Tuesday morning, Council members Sara Lipsett and Melinda Kane and members of my administration joined me for the latest meeting of the Cherry Hill Citizens Cabinet. For about 90 minutes, I shared news and other important information with these ambassadors within our community, and answered questions about topics that ranged from public safety, to ongoing economic development projects and upcoming events. I also shared details about our efforts to expand our online governmental services and make information more accessible to our residents, as well as updates about ongoing economic development and other Township news and events. The Citizens Cabinet and Business Council meet with me every other month, and were created as a way for me and my administration stay in touch with the residents of Cherry Hill. As always, Tuesday's meeting was a lively one, and I want to thank the members for their continued engagement. For more information about either of these groups, contact my office at (856) 488-7878, or e-mail DMellon@chtownship.com. Registration is now open for Spring 2016 classes and programs offered through the Township's Recreation Department, and I'm pleased to invite all our residents to explore a new tool we recently launched that will make it easier to enroll in upcoming classes and programs, to buy event tickets, and to stay in tune with all the great things that are happening here in Cherry Hill. This new online portal, called Community Pass, is very user friendly, and makes it easier for our Township staff and class instructors to communicate with residents who have signed up to participate in our programs. And, for the first time ever, you can purchase tickets to upcoming events - movies, live performances, senior luncheons, and so much more - online, making it more convenient for you to buy tickets and experience the wonderful cultural programs and live entertainment our community has to offer. Visit the CommunityPass website today to explore our Spring 2016 program and class offerings, and for a full list of upcoming events. For more information, contact the Recreation Department at (856) 488-7868, or e-mail Recreation@chtownship.com. Residents looking to dispose of old automotive fluids, household cleaners, pesticides and other common household waste that is prohibited from curbside trash disposal can bring those items to the Department of Public Works from 8:30 a.m. to 3 p.m. Saturday, March 19, for a special Household Hazardous Waste collection event. Disposal is free for Camden County residents. This special event is a partnership between the Camden County Board of Freeholders and Cherry Hill Township. Click here for details. Council members Brian Bauerle and Carole Roskoph present a proclamation to Valentine's Ball honorees Ray and Nora Benitez. Council members Carole Roskoph and Brian Bauerle attended the Filipino American Society of South Jersey annual Valentine's Ball in late February. As part of the event, they presented a special proclamation to this year's Love Award honorees, Raymond "Boots" and Nora Benitez for exemplifying community and family leadership. The couple has served as past presidents of FAASJ and are very active within the community. Nora is involved in nurses issues and Ray is active with the Rizal Centennial Community, and was instrumental in the Rizal monument project, which is has become an important piece of our community. Congratulations to Ray and Nora on their award, and thank you for all you've done for Cherry Hill and South Jersey! Daylight Saving Time Begins Sunday, March 13. 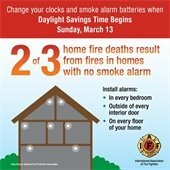 Remember to change your clocks and smoke detector batteries. To be on time for your Sunday activities, remember to turn your clocks forward one hour Saturday night, as we usher in spring with the start of Daylight Saving Time. The Cherry Hill Fire Department reminds residents that this is an ideal time to change the batteries in their smoke and carbon monoxide detectors! A working smoke detector can double a person's chances of surviving a home fire. More than 90 percent of homes in the United States have smoke detectors, but one-third are estimated to have dead or missing batteries. The Cherry Hill Fire Department offers a home smoke alarm program. For more information about this program, click here. 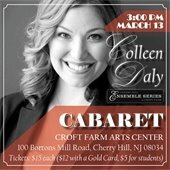 Join us this Sunday, March 13, as we welcome Academy of Vocal Arts alumna Soprano Colleen Daly back to the Croft Farm Arts Center. Ms. Daly is rapidly emerging as a “dramatically powerful” (The Washington Post) singer in today’s operatic arena. The show starts at 3 p.m.; doors open at 2:30. Tickets are $15 each ($12 with a Gold Card, $5 for students). For more information or to reserve your seats, call 856-488-7868, or email Arts@CHTownship.com. Join us tomorrow from 8:30 a.m. - 1:30 p.m. and learn about organization, relationship building and financial planning for special-needs children. 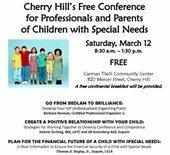 Cherry Hill's annual Free Conference for Professionals and Parents of Children with Special Needs will take place from 8:30 a.m. to 1:30 p.m. this Saturday, March 12, in the Carman Tilelli Community Center, 820 Mercer St. Don't miss out on this wonderful conference, which provides caregivers with useful information about important topics related to raising children with special needs. This year's presentations will touch on topics including the importance of organization, strategies for building a positive relationship with your child, and financial planning for children with special needs. This is a valuable opportunity for interested adults to gather resources and information about the many topics affecting the special-needs child. Attendance is free, but registration is preferred. For more information, call (856) 488-7868, or e-mail Ombudsman@CHTownship.com. As the Barclay 200 celebration festivities continue, Save the Date for our next great event, at 7 p.m. Tuesday, Mar. 22, at the Cherry Hill Public Library, as we celebrate Women's History Month with a look at "Jersey Women: Visionary and Strong." Join the discussion and learn about local pioneer Elizabeth Haddon Estaugh (1680-1762) and 19th-century abolitionist mother Charity Still, who were among the parade of remarkable women whose lives left a significant stamp on both the state and the region. In this talk, we will explore the worlds out of which they created their legacies and the daily lives of Quaker women in the 19th century. Be sure to get your PastPort stamped, pick up a commemorative Barclay200 postcard, and enter to win a special door prize. This event is free and open to the public. Registration is not necessary. For a full rundown of our Barclay200 activities, click here. For more information, call (856) 795-6225, or e-mail info@barclayfarmstead.org. Be sure to follow @HistoricBarclay on Twitter and Barclay Farmstead Museum on Facebook for information on upcoming events and activities throughout the year. Cut your carbon footprint by biking to this year's Earth Festival on April 30! As you make plans to visit this year’s Sustainable Cherry Hill Earth Festival, don’t forget about our Family Fun Bike Ride, which serves as the official kick-off to festival activities at 8 a.m. Saturday, April 30. You can help reduce the carbon footprint of this year’s festival: First, ride to Croft Farm with your family and friends to join in the free Family Fun Bike Ride, as a fun and healthy way to start the day. Click here to register, and for more information. After the ride, park and lock your bike in our NEW valet area across from the Croft Farm House, and enjoy the Earth Festival from 10 a.m. to 2 p.m. Bike valet is supported by the Courier-Post. Learn all about the Family Fun Bike Ride and bike valet by clicking here. There are many other ways you can reduce both the festival's and your own carbon footprint during South Jersey’s Earth Festival celebration! Bike to the Family Fun Bike Ride: Registration and check-in runs from 8 to 9 a.m.; prizes will be awarded! Special thanks to our Green Sponsor, Cherry Tree Corporate Center. Park your bike at the new bike valet area supported by the Courier-Post. Fewer vehicles driving to the festival = a reduction in CO2! Family Fun Bike Ride details are available here: register today! We look forward to seeing you at South Jersey’s largest eco-event! For more information, contact festival producer Brenda Jorett at EarthFest@sustainablecherryhill.org. Stay up-to-date on Festival news on Twitter. Bring your lunch and enjoy a free film at the Cherry Hill Library. Movie begins at noon (doors open at 11:30 a.m.). Adults of all ages welcome. No registration required. Click here to watch the trailer for Mr. Holmes. A monthly discussion group where attendees can discuss their writing, improve their skills and offer encouragement to one another. All skill levels welcome. No registration. LinkedIn is a social network where you can build your professional presence, connect with others in your profession, find inspiration, and as well as discover job opportunities. This class is designed to give you a basic overview on the abilities of having a LinkedIn account. You must have an email account to attend this class. Click here to register. There are almost 16,000 seniors (over 55 years old) living in Cherry Hill, and we strive to offer a variety of services, programs, activities and events for all our active adults. The spring season of Adult Education classes will begin in April and includes healthy-living classes such as yoga, tai chi, golf, tennis and aerobics as well as cultural enrichment programs in drawing, watercolor, clay design, Spanish and Italian. To view a catalog of available classes, click here to download a copy of our Spring 2016 Community Magazine. Visit our new CommunityPass portal to register for any of our available classes. It is important to me that our senior residents are aware of all the activities, services and resources available to them, which why our Recreation Department includes a Senior Services Coordinator, Gaye Pino. Gaye can help residents navigate issues or concerns among a variety of areas and Township departments. She is also available to give presentations about Township senior services. Please contact her with questions, concerns or to make suggestions for additional programs: gpino@chtownship.com or (856) 661-4800.